The short version of the Austrian True Money Supply (SVTMS) for the U.S. increased by 0.23% (12.79% annualised) during the most recent week ending 21 October to reach USD 9.7353 trillion calculated based on monetary statistics just released by FRED. 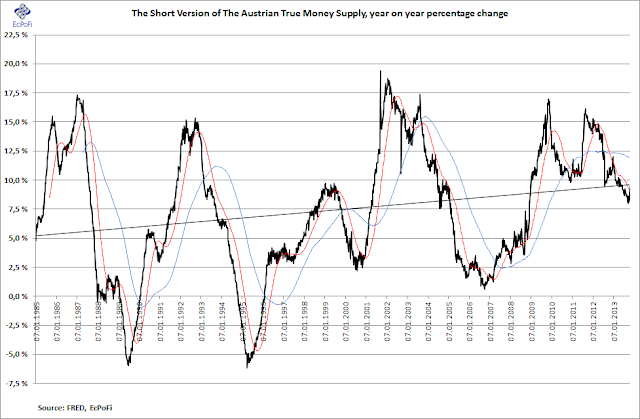 After sliding most of this year, the year on year (YoY) growth rate in money supply has picked up in recent weeks. 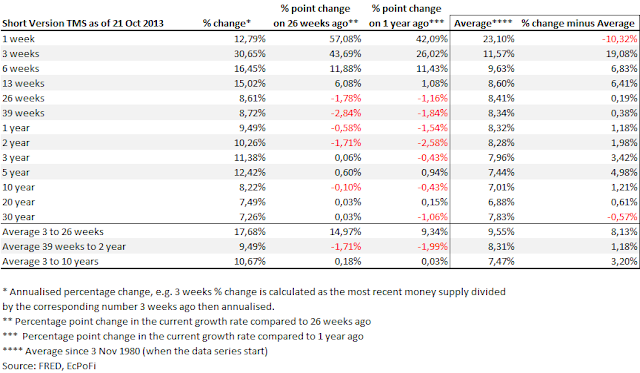 Five weeks the growth rate bottomed at 8.02%, this week it shut up to 9.49%, the highest for 21 weeks. A likely driver for this significant growth was the raising of the US debt ceiling during the week, immediately leading to increased borrowing by the government (e.g. here). To the extent that the recent increased borrowing was a "catching up" with little borrowing in the previous weeks (due to the debt ceiling debate) this could mean that borrowing and hence money supply growth could slow down a little again in the coming weeks (unless offset by increases in bank credit). 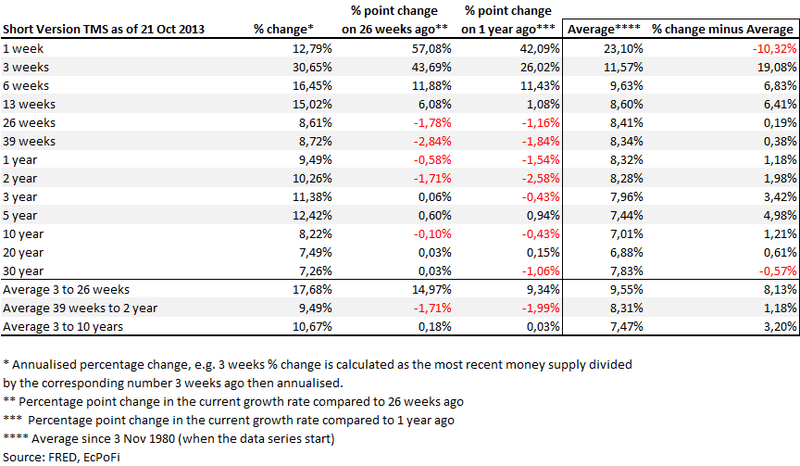 I've pointed out previously the plummeting of the 39-week annualised growth. 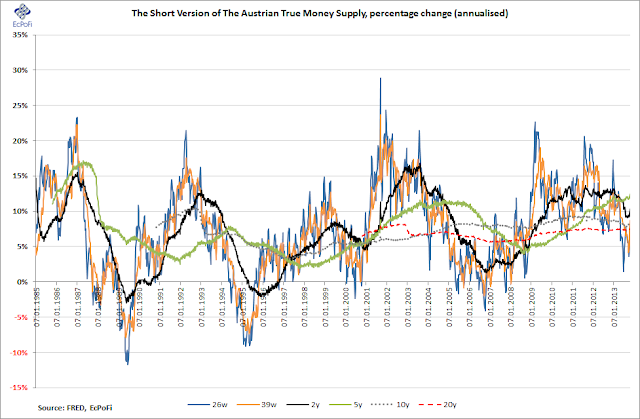 However, since hitting 4.20% four weeks ago, it has since increased steadily expanding to 8.72% this week. Despite this increase in recent weeks, the growth rate remains 2.84 percentage points lower than it was 26 weeks ago and 1.84 percentage point lower than one year ago. Overall, the shorter term growth rates continued to pick up pace from the increases discussed last week and the 1- to 13 weeks annualised growth rates are all now higher than they were 26 weeks and one year ago. The 39-weeks to 2-year growth rates still remain lower than 26 weeks and one year ago.